With all of the common Polaroid 600 cameras that I frequently find at garage sales and thrift stores, it’s always exciting for me when I stumble upon a vintage camera that I’ve never seen before. 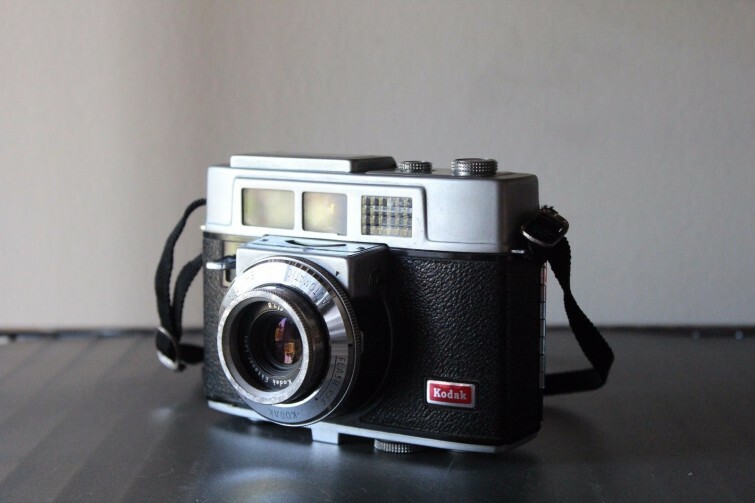 I found this Kodak Automatic 35F 35mm Camera at a garage sale for one dollar. The Kodak Automatic and Motormatic series were Kodak’s last American made 35mm cameras, and their first automatic exposure 35mm cameras. Tracing their original roots back to the Kodak 35 of 1938, there were seven different models; the first, the Kodak Automatic 35, was introduced in 1959. Based largely on the Kodak Signet 50, the Kodak Automatic utilized that camera’s basic body, film transport, and lens. The lens was a 44mm f/2.8 Kodak Ektanar (Lumenized), a 4-element Tessar design with front element focusing. Like many of Kodak’s better lenses of this period, the lenses are somewhat radioactive. The camera had a drum take up spool and bottom mounted advance lever. These are fixed-lens viewfinder cameras; focusing is by scale or estimate. The bodies are made from bakelite, with metal inserts, fittings, and attached plates. The top plate contains (from the right) the brightline window, the centrally located viewfinder, and the selenium meter cell. In addition to the viewfinder having a brightline for the 44mm lens and parallax marks for 3 and 5 feet, it displays the words “Close-ups,” “Groups,” and “Scenes” when the focusing ring is set to the appropriate click stop. The Automatic 35 originally sold in 1959 for a list price of $84.50 USD (approximately $$692.95 USD in 2015). This particular piece in it’s current, untested condition is valued between $30-50. Souce: camerapedia.wikia.com. For more information about decorating with vintage cameras, check out my piece on incorporating vintage cameras into a modern living space. For more information about cameras like this one, check out Brian Coe’s Kodak Cameras: The First Hundred Years.